All transactions are safe and secure with a reliable history in online purchasing behind each of our associates. Buy the Ghostbusters Glow-in-the-Dark Logo t-shirt to own Ghostbusters clothing and merchandise. Who you gonna call when you discover that your neighbor has been possessed by a dog-like beast named Zuul, or when you see a slimy green monster devouring a hotel cart? These glow in the dark Ghostbusters t-shirts will help to remind you who can fix your ghost problem. It doesn't matter how big the entity, Venkman, Egon, Ray and Winston are always up for any ghost removal task. Keep an eye out for the Ecto-1 Ghostbusters car (ambulance). 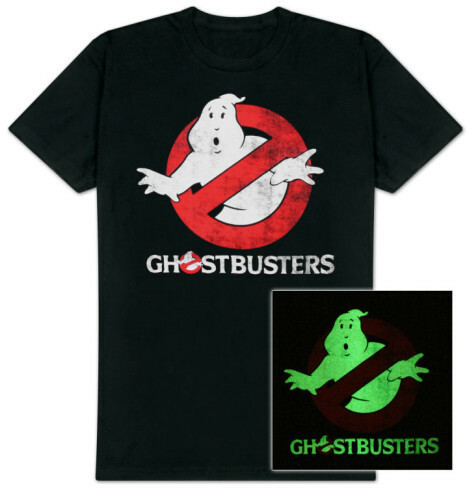 In addition to the Ghostbusters Glow-in-the-Dark Logo tee above, browse the Ghostbusters Clothing Gallery for more apparel like men's and women's clothes, kids shirts or hoodies.